The inspiration came from a few places initially. The concept was that this tribe of orcs has outposts sprinkled along their borders and only the bravest most dedicated of their warriors are given the honor of serving there. Their task is twofold… simple yet not. One to keep the beacon that each outpost has lit… never doused a fire to burn brightly from the tallest tower. The reason… to show those that need a way through the night a light to come home to, as well as the assurance that as long as those fires burn brightly their tribe is strong. That the tribe has weathered whatever may come and will survive. Orcs who have been lost, are bleeding from battle, or weary from being displaced can find a beacon… to come home because let’s face it. Everyone pretty much has it out for Orcs. The caretakers are the beacon, a place of safety and of strength when things can be so difficult. I dedicate this sim to those people… the quiet army that tends to the wounds, that celebrates each life and protects those they care for. This sim is also dedicated to my mother. This is the much more personal layer… the one that was not initially there but now is. I didn’t honestly think I was going to be able to complete the sim throughout some of this but she kept prodding me forward and I had to finish it. For her. For myself. This March everything irrevocably changed. Life was moving along as it does, the sims the plans the work. Family… I was feeling confident, settled, I had this and suddenly it spun out of control. After a brief stay in the hospital of less than a week my mother was gone. I felt like I was in a vacuum. I didn’t know what I was feeling and whenever those feelings started to surface again I would plunge into the vacuum unable to comprehend or deal with it. I talked to Elizabeth and said I wasn’t sure what I was going to do. She assured me of course that if it was too much to take care of myself, my family but she was there if I needed anything. I came to the decision that I needed to finish it. Even if it wasn’t going to exactly be what I had envisioned as it morphed while I worked on it, while I built it on the sim… the more warlike feel being changed into what you see now. I accept that though, my emotions tend to lead me along more than my head. I could have stopped and not done it… no one would have questioned why but it gave me something… it let me hold onto her for a little bit longer. My mother was always so proud of my creativity, of my talent. She always was so supportive of what I did, and would brag about the things I learned or did in Second Life even if she didn’t entirely understand it. She was proud of the work I did with RFL, the things we accomplish and if I had given up on the sim I felt like I would be giving up on her and what she believed in… in me. So I finished it… for her, for me. Sometimes late at night when it would get very hard… exhausted from trying to keep life together and my grief I’d sit at my computer working on it… when I felt like I couldn’t finish it I would talk to her… whispering under my breath… “We’ll make it Momma, we’ve got this, we can do this.” And sometimes…. Sometimes it felt like she was whispering back. 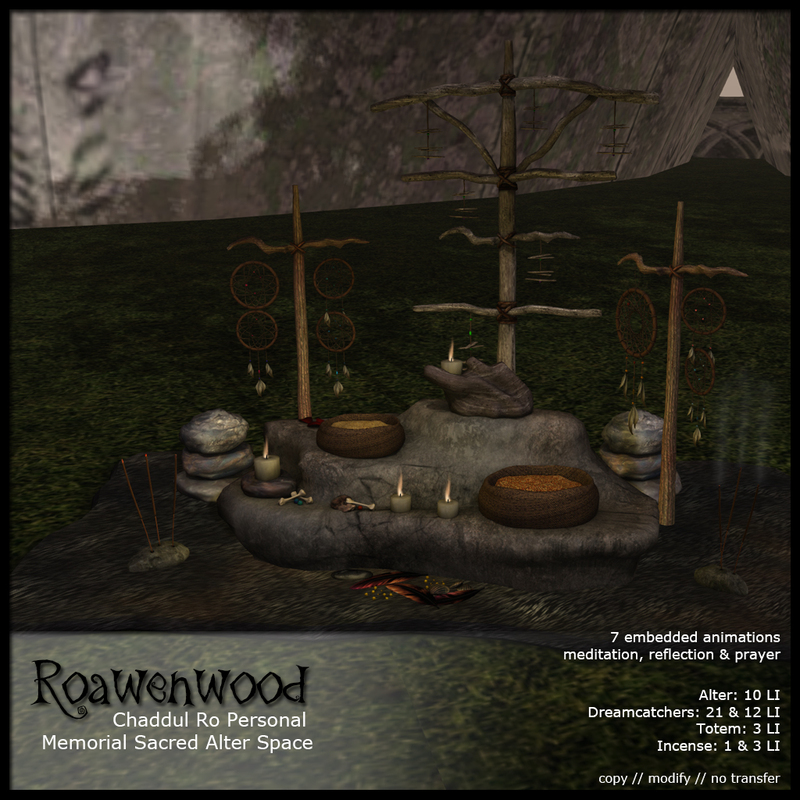 At the heart of the sim there is a sacred space that I was determined to finish… it was one reason I didn’t write this, it needed to be done or the sim wouldn’t have been even close to complete. Yes I wanted to add more, but this… this was important. Within it you will find a memorial area. Upon the alter there are little bits and pieces strewn around it, candles lit… incense burning. Each of them meant to represent something… the dreamcatchers, the little symbols. They are things my mother loved or remind me of her… it is a quiet place. It is funny in some ways I chose a tribal feel for my sim long before all of this because my mother was very in tune with this sort of thing in her life. So it fit somehow as if it was meant and within the story of the Orcs it is where they go to … to leave little tokens of past loved ones. Tokens for the living that they hold close to their heart…. A place for sharing, of love, dreaming and remembering. Protected as fiercely as the beacon high above in the towers and surrounded by the land… by the trees. This space is specifically dedicated to my mother, for all she believed in, for all that she was… for what she had always hoped to be. The Faire is so brief… far too brief sometimes it feels like but then other times it feels just right for what we need. That emotional giving, because if we are honest… no one could sustain the emotional levels that come about during this time every year all of the time. I believe the faire, these sims… while they are shopping, and events are also a sharing that we can’t and don’t find that often elsewhere. That is the magic of the Fairelands and I am so grateful to be allowed to build for you all and share these things with you so that maybe you can pause and have a breath… to connect with other people and to do things for a cause that helps so many. This year I am more grateful than ever because it has helped me find a little bit of peace and focus, it has helped me find ways to celebrate my mother, to help say good-bye to her and share it with those around me. That is the full story of my sim.